Hardy Pediatric Dentistry & Orthodontics offers Invisalign as an alternative method for straightening your teeth with a subtle, nearly invisible approach. For some of our patients, traditional braces are not convenient/desirable because of professional or social pursuits that they feel would be adversely affected by the wires and brackets. Invisalign offers you the ability to continue flashing your pearly whites without worrying about the hardware included with traditional braces. With Invisalign®’s clear, removable teeth aligners, Dr. T.C. Hardy can help you gradually move your teeth into a more desirable position, or improve issues with your bite, without the challenges of metal braces. Choose Invisalign® to correct your smile, and no one else has to know! If you would like to learn more about Invisalign®, or if you would like to schedule a consultation with Dr. T.C. Hardy to find out if this treatment option is for you, contact our office today. 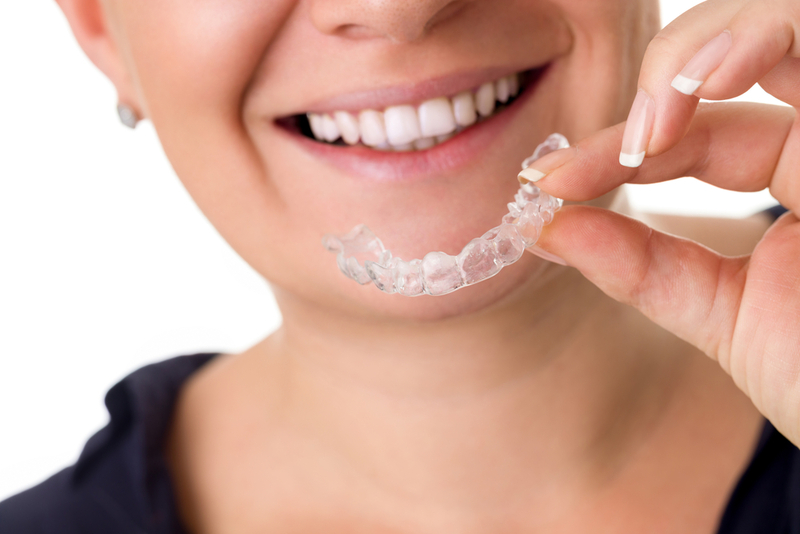 What Can I Expect During Invisalign® Treatment? During an initial assessment, Dr. T.C. Hardy will take an impression of your teeth. Based on the impression, he will create an individualized treatment plan with a series of custom-made, clear aligners to take home with you. You will wear the customized aligners for 20 to 22 hours per day in periods of two to three weeks at a time before moving on to the next aligner in the series. The series of aligners will gradually shift your teeth into a more desirable position. You can remove your aligners as necessary for eating, drinking, brushing and flossing. Most patients usually do not experience any significant pain or discomfort with Invisalign. The number of aligners needed and the total length of treatment can vary based upon your individual needs. Typically, Invisalign® patients may need 18 to 30 aligners for a period of 9 to 15 months in order to receive their desired results. Dr. T.C. Hardy will assess your progress throughout the Invisalign® treatment period to ensure it is working successfully. Why Should I Choose Dr. T.C. Hardy? Finding a reputable, skilled orthodontist you can trust is important in making a decision about who will perform your Invisalign® treatment and be involved in your ongoing care. Many general dentists may offer Invisalign® as part of their treatment options, but unlike a general dental office, an orthodontic office is 100% committed to orthodontic treatment. Dr. T.C. Hardy chose to spend two to three additional years after completing dental school to earn advanced education and training in a specialized orthodontic residency program so he can offer you the expert orthodontic skills you deserve. Dr. T.C. Hardy earned his specialty in orthodontics from Tufts University School of Dental Medicine, where he was extensively trained on correcting misaligned teeth, adjusting occlusion (the way the teeth fit together), and treating jaw disorders. If you have any questions about Invisalign®, or if you are interested in scheduling a consultation with Dr. Hardy, please contact us today at 720-887-6003. Dr. Hardy serves the community of Erie, Colorado, and is excited to meet you and your family.